The Alternative Network (T.A.N) originating in Nova Scotia has now developed into a strong 8 retail-location community. TAN promotes a network of fair trade micro-roaster cafés through financing, management training and business planning. Brainchild of Lay Yong Tan, recently participated with Andy from Te Aro in the Cup of Excellence Nicaragua. In my ventures through the amazing Indie Coffee Passport - I found a way to Queen and Ossington area to do some Ossington Strip Espresso Adventures. Known for the fast development of businesses/bars/social clubs. It's one of the hot spots to be seen. Revitalizing this strip will only be a matter of months, but T.A.N. has a great space, ample space for seating and an on-site roaster. The Cafe is lined with small cozy tables, and long benches, with an outdoor patio. The space seems industrial, but the red warm walls give it the homey feel. As you start to decipher the menu, it might be daunting. Using the roaster keeps the space warm and toasty during the colder months but fills the cafe wtih a great scent. Verdict: Rich body - more toned chocolate flavours, but a brightness that seems pleasant at first but turns annoying. Develops into a more rounded feel once cooled. The South American beans really flourish from the cup, but the brightness distracts me. I'll leave you with some patio photos - happy Espresso Adventures! 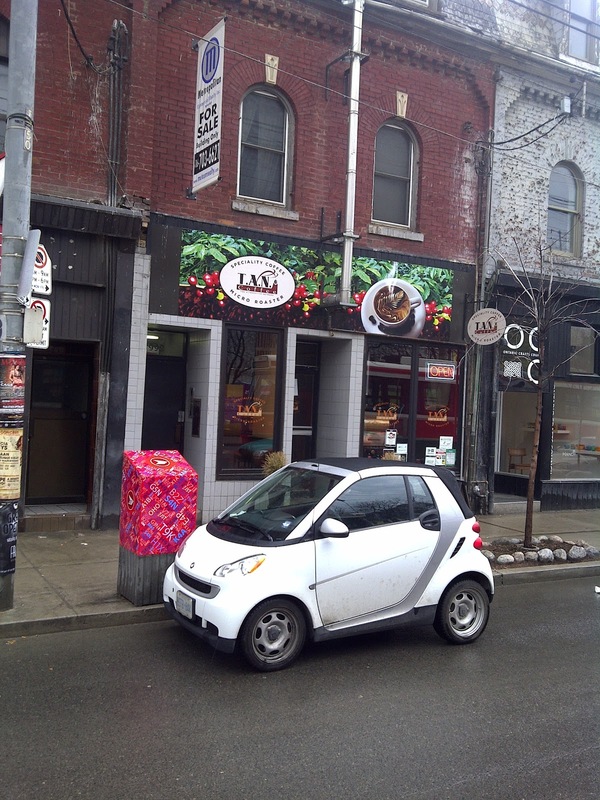 On a side note, this is the only place in TO I found that actually put cafe lungo on their menu (I spoke to the barista and he mentioned that it was super popular among older Italian men in the area).